Abstract: This report describes a 40-year-old male patient with symptoms affecting the nasal sinuses including nasal obstruction and olfactory anesthesia. Magnetic resonance imaging demonstrated that the tumor eroded the adjacent bone and bilateral frontal lobes. The biopsy sample of the left nasal mass was processed for both H&E staining and immunohistological staining for various markers. The final histological examination showed large-cell neuroendocrine carcinoma with poor differentiation. 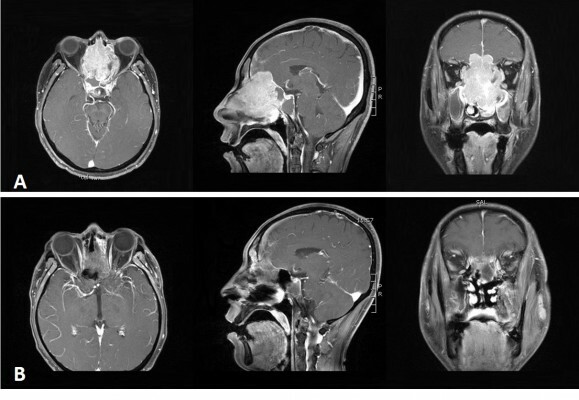 After a general evaluation, the patient was staged as cT4bN0M0. The patient was treated by combined radiotherapy and chemotherapy. The treatment yielded almost complete remission, and after 10 months of follow-up, no distant organ metastasis or recurrence in the primary tumor region was detected.We report this rare case and review the current literature of this tumor.